This might be the ultimate in foolishness. 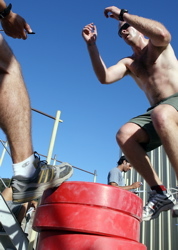 The guy in the picture is jumping onto a pile of bumper plates while the training partner tries to steady the shifting pile with his foot. This is a lawsuit waiting to happen. You have to love the internet. I wrote the post below on May 31 of this year and everything I said is true. I saved it as a draft and I never published it, not sure why to be honest. Today made me realize even more why I love Facebook. I just sent Happy Birthday notes to three people I really value., my neice and two good friends. If it were not for Facebook I would never have remembered. Make sure to read the rest of post and then log in to your Facebook account and check your birthdays. Recently it came to my attention that Mike Boyle Strength and Conditioning had a loosely organized alumni group on Facebook. The group is called Boyle’s Alums. If you are a former MBSC athlete and would like to join and reconnect with old friends look it up. We also have a more formal Mike Boyle Strength and Conditioning page and we’d love for you to join that also. Like many soon-to-be fifty year olds, I , until recently, did not have Facebook page. I considered it a “kid thing” that had little value for my generation. Truth is I created a Facebook page because I thought it might be good for business. However, I had a very pleasant surprise. One, it can be good for business as it is a great networking tool. Two, people who I thought I would never see again suddenly came back into my life via Facebook. It seems like almost every day I get a fun little blast from the past from one of my former athletes. It’s great to see who’s married, who has kids and who lives where. I still haven’t figured out how to leverage Facebook for business purposes but, I will soon. In any case it doesn’t matter because I am thoroughly enjoying my use of social media just to renew old acquaintances. I now have over 1000 Facebook friends and am adding new friends every day. Take a minute. Log on and create a Facebbok page and while you are it, send me a friend request. I spoke yesterday at Fitness Millions in NJ for Pat Rigsby, Nick Berry and Jim Labadie. Great guys and great attendees. One of our readers asked if I could share what I talked about, so here goes. Over the next few weeks I’ll pull out some ideas from my talk to share on this blog. The first thing that came to mind was the concept of “starting on third base”. Every budding coach or trainer wants to start on third and run home. I can’t tell you how often I get people saying something like “Can I help you train your pro athletes?” My answer is always the same. “No, but you can help me train my 12-15 year olds then, if you show me you can coach, you might get better high school kids. Then if you do a really good job you might get to work with the pros”. The key lesson is that if you want to climb a ladder, don’t try to skip rungs. Be willing to start at the bottom and climb one rung at a time. I am about 1/4 of the way through the book Warrior Girls- Protecting Our Daughters from the Injury Epidemic in Women’s Sports. I think the book was originally recommended to me by Strengthcoach.com member Bruce Kelly, a coach who has a daughter/ athlete himself. In any case if you have daughters or train female athletes this book should be on your “must read” list. Warrior Girls is not a science book but more of a social commentary on youth sports with particular emphasis on how young females are impacted. Possibly the most interesting concept in the book is author Michael Sokolove’s premise that the concepts of Title 9 and equality may have done more harm than good in some cases. Many would argue but, please don’t if you haven’t read the book. Sokolove seems to be making the case that some women’s sports advocates may in effect be sweeping the female ACL epidemic under the rug because it may undermine all of the successes of Title 9. Take some time and read Warrior Girls. A 2008 New York Times article had takes an interesting view of 40 yard dash times and NFL success. The gist of the article was that it is not how fast you run but, a combination of how big you are and how fast you run that predicts success. I have always been a big fan of the Lewis Formula for the same reason. The Lewis Formula takes vertical jump and bodyweight into account. The current standard appears to be the Sayers Formula. In any case it is obvious that it is not just how fast you run or how high you jump but how much mass is moved in either case that really makes the difference. It is interesting to see how few pro teams in any sport have taken this information into consideration when drafting players. In fact many NHL teams actually value aerobic power over anaerobic power. Scary thought. In April of 2007 I wrote a piece called 25 Mistakes in 25 Years. The article was inspired by a Barbara Walters special about her top 30 mistakes in 30 years in the entertainment business. I wrote it on a train to New York City with no expectation. It has been called “the best piece you have ever written” more than once. Because of the excellent response I centered my 2008 Perform Better Summit presentation around the article. In the presentation I outlined the top mistakes of my career and also highlighted my top ten new ideas for 2008. In “The Evolution of a Coach” Michael Boyle shares the lessons he has learned after coaching thousands of athletes over 25 years. 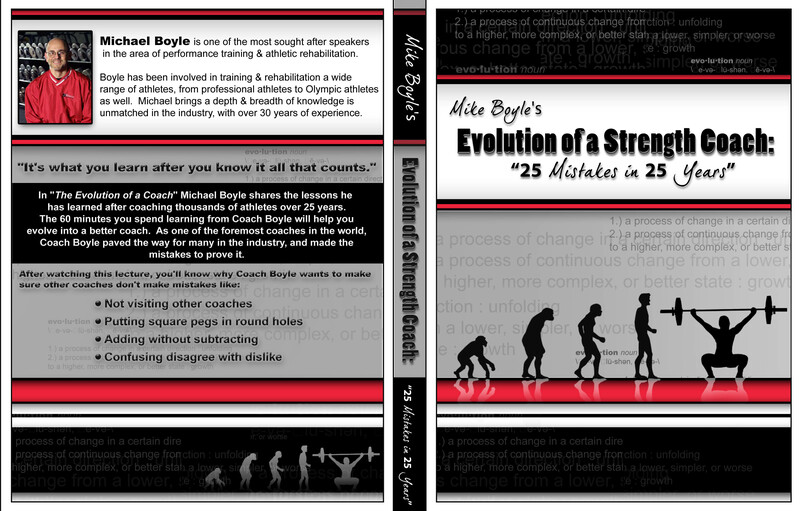 The 60 minutes you spend learning from Coach Boyle will help you evolve into a better coach. As one of the foremost coaches in the world, Coach Boyle paved the way for many in the industry, and made the mistakes to prove it. Hope you take a moment to check it out. A recent thread on the www.strengthcoach.com forum got me thinking. The question was about using med balls throws that might best be called Reverse Throws? Bottom line, I think these may be a good way to get hurt. I don’t think there is sports skill that I can think of that involves this type of action. I think this is a great example of overthinking and a better example of square pegs in round holes. Think about this violent action done effectively in the wrong direction. Even though the athlete in the video does a pretty good job getting hip internal and external rotation, think about the havoc this wreaks on the back of someone with poor hip mobility. To me the exercise has two huge flaws. 2- It looks like it was designed as a way to get injured. Truth is we used to do these ( because we were copycats looking for variations) but, have not for about 6 years.